Natural gas has been getting some good press lately -- and some not-so-good press. Natural gas provides 21 percent of U.S. electricity right now and the figure will rise to 40 percent by 2035, according to consulting and construction giant Black & Veatch. And one type of natural gas, shale gas, obtained through hydraulic fracturing, is becoming an increasingly contentious issue. Some see natural gas as a coal replacement, a transition fuel as we move towards renewables, and a potential way to power much of our transportation -- freeing us from our reliance on imported oil. Others see fracked natural gas as another air-polluting fossil fuel with horrific potential to damage our aquifers. In an interview last week with Jon Stewart on The Daily Show, T. Boone Pickens claimed that "Fracking started in 1953 [Wikipedia says 1949] and I do not know of one well -- they are always saying it contaminates the aquifer, [but] I've never seen that happen," adding, "I have fracked 3,000 wells in my life. I have never seen anything damaged." Pickens claims that the United States has natural gas reserves that are equivalent to 700 billion barrels of oil and it is his personal crusade to move that ocean of natural gas into the American transportation sector. He claims to have already spent $62 million on this quest, known as the Pickens Plan. Vikram Rao, former CTO of Halliburton and the current Executive Director of RTEC (Research Triangle Energy Consortium), said that the shale gas supply "is the most important energy event in the U.S. since the discovery of Alaskan oil." Rao sees the water transport and contamination issue as solvable. But according to a website devoted to an anti-fracking movie, Gasland, "For each frack, 80 to 300 tons of chemicals may be used. Presently, the natural gas industry does not have to disclose the chemicals used, but scientists have identified volatile organic compounds (VOCs) such as benzene, toluene, ethylbenzene and xylene." The film also suggests that explosive gases have entered private water wells, causing "flammable water." Here's a link to the FAQ at the film's website and here's a link to a long list of "Chemical Constituents in Additives/Chemicals" used in fracturing identified by the state of New York. An oil and gas industry website, Energy in Depth, sees it another way and maintains that the typical solution used in hydraulic fracturing is 99.51 percent water and sand and only 0.49 percent additives. They tend to see the glass of (polluted?) water as half full. The website casts doubts on many of Gasland's claims and asserts it is not a documentary but propaganda. There's certainly an opportunity for a new water decontamination technology to mitigate the pollution in the produced water. According to an article this week in the New York Times, "Drilling service companies have injected at least 32 million gallons of diesel fuel underground as part of a controversial drilling technique, a Democratic congressional investigation has found." More from the Times article -- injecting diesel as part of "hydraulic fracturing" is supposed to be regulated by U.S. EPA. But an agency official told congressional investigators that EPA had assumed that the use of diesel had stopped seven years ago. 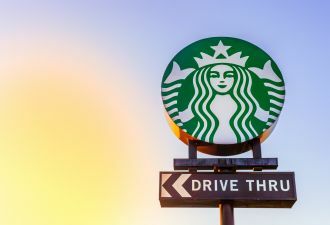 "The industry has been saying they stopped injecting toxic diesel fuel into wells," said Rep. Henry Waxman (D-Calif.), the ranking member on the House Energy and Commerce Committee, who led the inquiry. "But our investigation showed this practice has been continuing in secret and in apparent violation of the [Safe Drinking Water Act]." Industry officials derided the lawmakers' announcement, saying it was long on sensationalism and short on substance. Congress exempted hydraulic fracturing from EPA regulation under the Safe Drinking Water Act in the energy bill of 2005. Critics now refer to this as the "Halliburton Loophole." Halliburton [see Rao above] is a major provider of fracturing services and was the chief company lobbying for the exemption at the time. "Drilling companies have won exemption from just about every piece of federal environmental law except the requirement to get permits if they use diesel in their fracking fluid," said Dusty Horwitt of the Environmental Working Group. "How can communities trust these companies to drill responsibly?" Natural gas won some positive spin in Obama's recent State of the Union address. "Some folks want wind and solar. Others want nuclear, clean coal, and natural gas," Obama said. "To meet this goal, we will need them all, and I urge Democrats and Republicans to work together to make it happen." Carl Pope, Chairman of The Sierra Club, spoke of coal and how utilities have powerful incentives to hold on to coal. Pope said, "Renewables and gas are fighting for table scraps while we should go after coal." 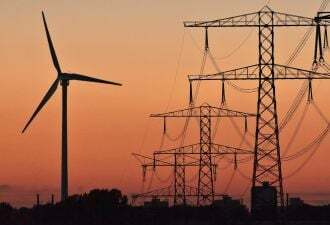 He urged, "Make sure that the Public Utility Commissions do not allow irrational investments in upgrading 50-year-old coal-fired power plants." Pope suggested, "Run the railroads on natural gas, not diesel, [...] run fleet vehicles on natural gas," and "Replace peakers with fuel cells." He asked, "Can we power locomotives with fuel cells or natural gas?" That's not exactly the oil and gas lobby speaking there. According to The Oil Drum, water needed for hydraulic fracturing and disposal of produced load water are becoming serious obstacles for Marcellus development. The problem with water sourcing is not availability, but rather getting water management plans approved for the high volume withdrawals (drilling requires about 100,000 gallons and completions use another 3 million to 4 million gallons). There are few waste treatment plants and the cost of transporting disposal water from the well may add $250,000 to the cost (Tudor, Pickering and Holt, 2009). 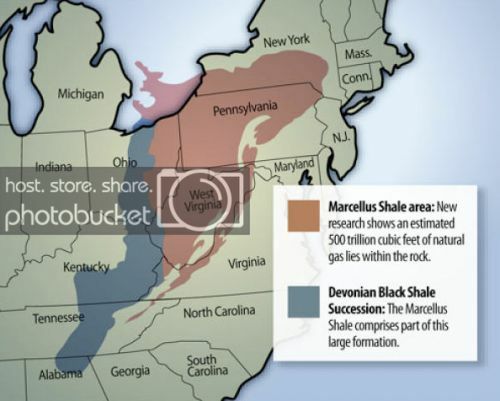 The Marcellus Shale extends from southern New York across Pennsylvania, and into western Maryland, West Virginia, and eastern Ohio. The production of commercial quantities of gas from this shale requires large volumes of water to drill and hydraulically fracture the rock. This water must be recovered from the well and disposed of before the gas can flow. 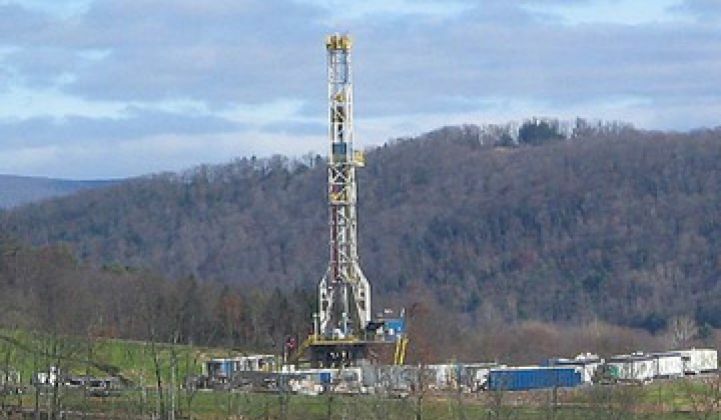 Concerns about the availability of water supplies needed for gas production, and questions about wastewater disposal have been raised by water-resource agencies and citizens throughout the Marcellus Shale gas development region.